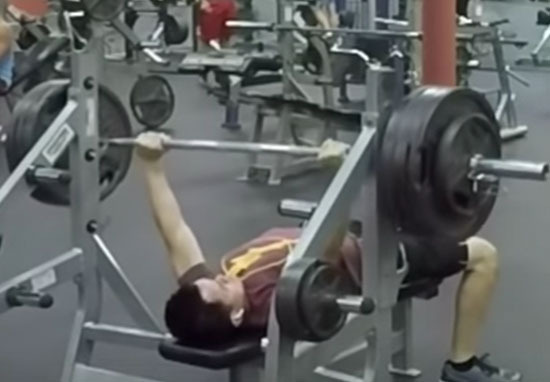 A former high school weightlifter who weighs 10 stone made bench pressing 165 kilos look easy, and other gym goers couldn’t believe their eyes. Long Nguyen, from Florida, regularly posts workout videos to his YouTube and Instagram channels, but one of his most recent videos showed the other people in the gym being blown away by his strength. He bench pressed a few different weights throughout his session, and when Long started benching almost triple his body weight the gym goers couldn’t tear their eyes away. As he increased the weight to a whopping 395lbs (179kg), Long asked another guy in the gym to spot him, but he made it known that he probably wouldn’t need help. No lift off and I’ll say spot if I need help. I won’t stop pushing so you don’t need to deadlift today. Though he described the lift as ‘slow’, he managed to complete the rep which weighed almost three times as much as himself. I don’t think anyone could criticise him for being slow after that accomplishment. Long then got rid of his spotter and lowered the weight to 165 kilos. He achieved the bench press with what looked like very little effort, and by that point had started to gather an audience to his impressive show. Two other gym goers watched as Long bench pressed various weights, while another man who had been on an incline press stood and watched the former weightlifter with admiration. First, thank you for the tremendous support you’ve shown in recently uploaded videos. You continue to surprise me and I wanted to try to thank you with another quick upload. During editing of this video, I discovered one of the coolest (in my opinion) reactions I’ve ever witnessed. Wish I was more aware during the workout, I would’ve walked up to the guy and thanked him for the good vibes. People at the gym with Long weren’t the only ones who were impressed by his skills. His video received lots of praise from impressed viewers. I don’t get why dudes aren’t congratulating you for the massive amount of work it takes to get to that point. Long has some top tips for bench pressing – though I certainly wouldn’t go straight in for trying to lift triple your weight. I think I would have applauded Long if I’d been at the gym with him. The most I can lift is one of those 10kg weight bag things.